Get lasting protection for important documents and keep them in top shape. The durable Standard Weight sheet protector is ideal for moderate use while the clear finish offers balanced presentation clarity while minimizing glare. Get lasting protection for important documents and keep them in top shape. The durable Standard Weight sheet protector is ideal for moderate use while the clear finish offers balanced presentation clarity while minimizing glare. The Clear Binding Edge completes the professional presentation look. Non-stick sheet protectors are made from polypropylene and are PVC-free. Acid-free and archival safe material ensures print remains on paper instead of on the protectors and documents will stay well-preserved. Keep your presentation pages in top shape with Avery® Sheet Protectors. 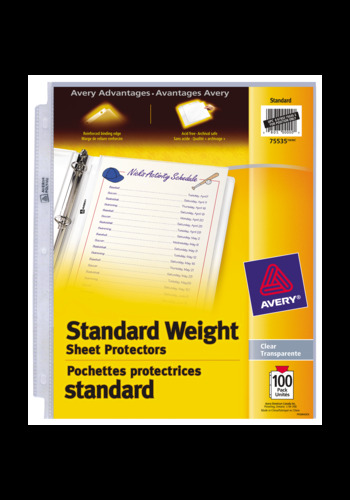 Standard Weight sheet protectors are strong enough to protect documents from spills, tears. The Clear finish offers a balance of clarity, contrast and minimal glare to view documents. Ideal for light to moderate use.